Since I began taking two classes my brain fog has become more of a problem. It got really bad this past weekend – I must have had a crash. If I’m honest I was pretty scared and thought seriously about withdrawing. 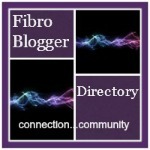 My fibromyalgia first started when I was in school last time- although back then it was a full time graduate programs. I was very worried about all my symptoms, but of course I thought they would get better once I was able to take a break. They didn’t. I have been so grateful for my fairly predictable, although limited, energy supply; having low energy and brain fog is not my most difficult symptom. I know for many people with FM and CFS have it much worse in the fatigue department than I do. If I take my sleeping pills, sleep for 11 hours and don’t over schedule myself, fatigue does not usually bother me. This most recent crash made me worried that if I push myself too hard at school again there may be no going back. So, I tried everything I could think of and seem to have been able to recover my energy almost back to normal levels. The most helpful thing was taking a daily scoop of my protein powder (25 g) in a berry and greens smoothie. I have also doubled my D-ribose supplement amount to 5 g twice daily. Finally, I have been setting two alarmfor each evening to get to bed on time. One of them just went off so I should cut this short! Hope this gives some ideas if you’re looking for them!